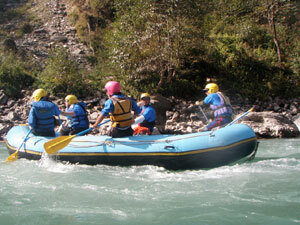 We offer trip for 1-3 days on Trishuli River distance 20–60 km., starting from Baireni or Chraudi(approximately 3:30 hr.) and take out on the way of before gaighat and for day or 2-day rafting trip we start from Charaudi (3:30 to 4 hour) during pre-monsoon and post monsoon season. In monsoon season, usually we start trips from Fishling (3 to 3:30 hour) and after end the rafting trip is accessible to continue your journey to Pokhara (appr. 4 hr.) or Chitwan National Park (appr. 1:30 hr.) or you may drive back to Kathmandu (appr 4:30 – 5 hr.). Mountain River Rafting arranges also necessary transportation or Tourist bus to the put-in point and from the take out point at the end of trip it may depends on requirement of clients. Before heading every outdoor trip we would like to request to our guests to be gathered at our office for pre-departure meeting as it is also prime concern to introduce with our team-Trip Leader, Guides, trip staffs and other guests, complete final official formalities, discuss about the trip system, timetable and other important matters to make your happy journey successful.